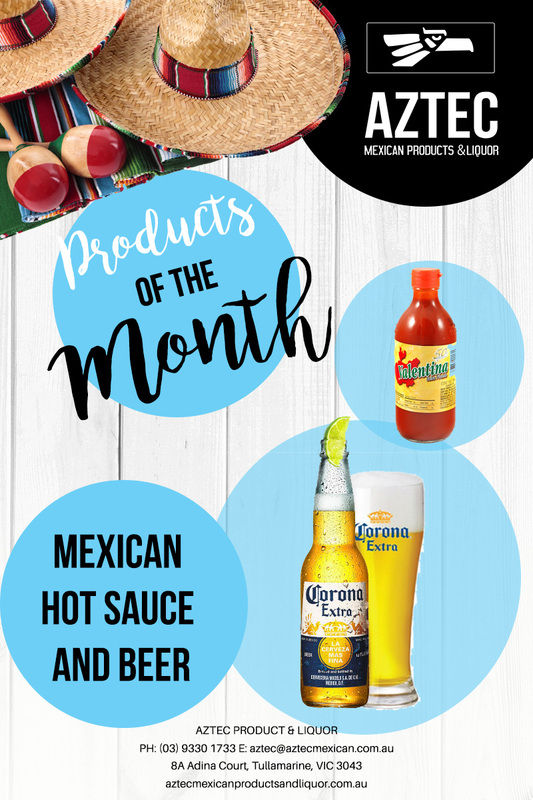 July Monthly Specials – Mexican Hot Sauce and Beer! There’s nothing like a flavoursome Mexican hot sauce to warm up your Mexican dishes this winter! If you are looking for a great Mexican hot sauce then we have just the product for you – and it is one of our specials this July. We enjoy sharing our love of Mexico, so every month we offer some of our finest products at reduced prices. At $3.00 per bottle, spicing up your meals just got a whole lot easier. This Mexican hot sauce is a staple for many Mexican foodies, and goes perfectly with any of your favourite recipes. Enchiladas, Burritos, Quesadillas… or you can even add it to your slow-cooked winter casseroles to warm you up on the inside. An authentic Mexican meal tastes even better when you pair it with a great beer. So to up the ante on our July monthly specials, we’ve added Corona beer. Now one of the most popular beers in Australia, Corona beer has a crisp, refreshing taste that makes you feel like you’re having a siesta in Mexico itself. For this month, we are selling Corona for $44 per case (24 bottles) – our cases are usually $57.20. This is a massive saving. Who says beer and winter don’t mix! So get the ball rolling on a mid-year Mexican dinner party. With Mexican hot sauce, you can create a table spread that knocks people’s socks off. And bring some extra cheer to the party with a chilled Corona beer, complete with mandatory lime wedge. At Aztec Mexican Products and Liquor, we have a wide range of the best Mexican products, all found in one convenient online store. Fill your pantry with delicious sauces, spices and beans, and stock the drinks fridge and liquor cabinet with some fun Mexican liquor. Be sure to follow us on Facebook and Instagram to keep up with everything happening at Aztec Mexican, including amazing recipes and latest news.